HORSE CAVE, Kentucky (August 8, 2017) — For years, the Palmore Farm was one of the best-known farms in Horse Cave, used for breeding replacement heifers for Ohio businessman Chuck Moeller’s dairy in Ohio. But in September, the farm will be offered at auction, with Schrader Real Estate and Auction Company marketing the property and conducting the auction. The 633-acre farm in Hart County was owned by Ohio businessman Chuck Moeller for years. Moeller died in 2013, and the family sold the dairy. “There’s no family in the Horse Cave area, and Mr. Moeller’s heirs have just been leasing out most of the land since 2015, so the family has decided it’s time to go ahead and sell the farm,” said Brad Horrall, who is managing the auction for Schrader. Schrader personnel will be available to accommodate inspections of the farm August 18, August 31, and September 7, as well as on the day of the auction. The auction will begin at 6 p.m. Thursday, Sept. 14, at Cave City Convention Center. Individuals seeking specific times and other information may visit www.schraderauction.com or call 877-747-0212. Online bidding will be available by prior arrangement. The farm will be offered in 12 contiguous tracts ranging from 24 to 124 acres, including one tract with a classic two-story, five-bedroom cut-stone home, according to company President R.D. Schrader. “The farm has approximately 579 USDA cropland acres, municipal water and wells, a great deal of frontage on good roads, and has a nice combination of fenced pasture, row crops and farm buildings. It adjoins the east side of Horse Cave,” said Schrader. “Some bidders might be interested in the home, whereas others might be investors or operators who desire some of the pasture or cropland,” he said. 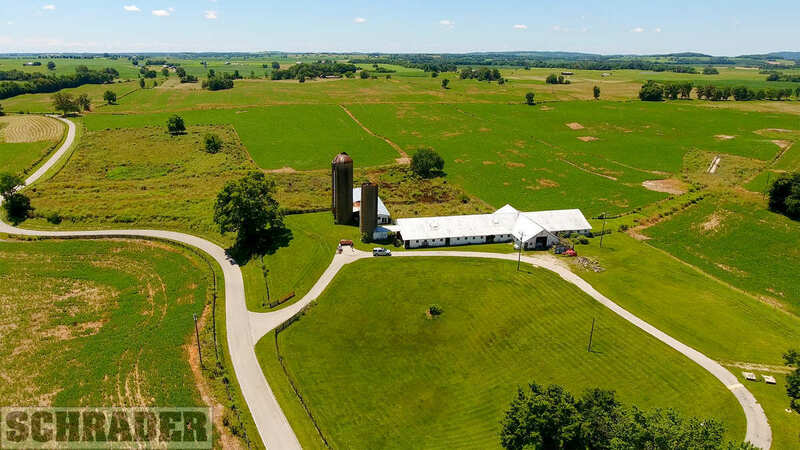 Schrader Real Estate and Auction Company, based in Columbia City, Indiana, is a leading auctioneer of farmland,real estate and equipment throughout the United States and is a five-time USA Today/National Auctioneers Association Auction of the Year winner.